The world is full of beautiful beaches, especially Texas since it has 600 miles of sparkling coastlines, piers, ports, seawalls and cities that thrive on its trade. As a photographer I have had the pleasure of shooting most parts of South Texas throughout my entire life. It’s a haven for migratory feathered friends, birdwatching, wildlife, bar hopping events, beachcombing, spring breaks, resort vacations, fishing, Victorian homes and building sand castles. Never did I miss an opportunity, come rain or cold weather, to pull my shoes off and take a footsy splash in the Gulf waters. I’ve camped out on the beach and weathered out coastal storms and hurricanes. Whether you are sightseeing or a resident of the southern state, the attractions are endless; from the Schlitterbahn to the beaches of Padre Island you can plan an abundance of adventures with its museums, historical monuments and sites, day trips into Mexico, parks and nature trails, golfing, dining, cultural arts, racing, rodeos, cruises, missions and mansions! Elissa Sounds (C) Elissa ~ Pier 21 ~ Galveston, Texas The Galveston Historical Foundation operates this historical ship, Elissa, boasting her coastal flags at Pier 21! She was built in 1877 in Aberdeen, Scotland by Alexander Hall Company and proudly stretches 99 feet, 9 inches at the main mast! She officially launched October 27, 1877 and endured a 90-year commercial purpose carrying varieties of cargos to ports around the globe. As well as boarding to enjoy her Texas Seaport Museum, she remains fully functional and visitors can enjoy the high seas with scheduled sails, too! Digitally Painted from my original photo! 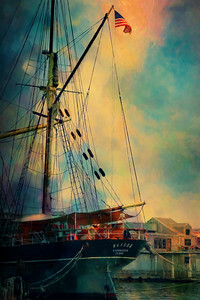 Elissa Sounds (A) Elissa ~ Pier 21 ~ Galveston, Texas The Galveston Historical Foundation operates this historical ship, Elissa, boasting her coastal flags at Pier 21! She was built in 1877 in Aberdeen, Scotland by Alexander Hall Company and proudly stretches 99 feet, 9 inches at the main mast! She officially launched October 27, 1877 and endured a 90-year commercial purpose carrying varieties of cargos to ports around the globe. As well as boarding to enjoy her Texas Seaport Museum, she remains fully functional and visitors can enjoy the high seas with scheduled sails, too! Digitally Painted from my original photo! 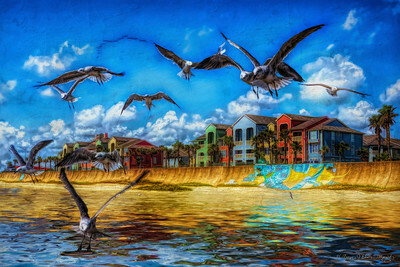 Clear Lake Shores, Texas This will make a fabulous wall mural! 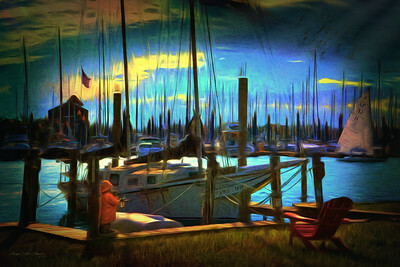 Sections of my original photo along with other elements I created, I bring you an underwater seascape style piece of art! Hope you enjoy! The original "painted" photo is above. Digitally Painted from my original photo! 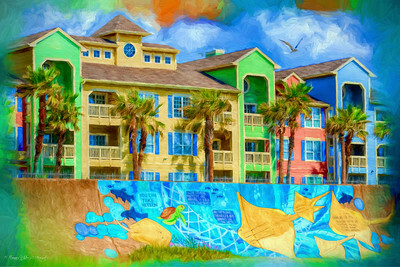 Galveston Beach, Texas While I worked on this photo I took of the colorful Dawn Condominiums and mural by Texas artist, Mario Enrique Figueroa, Jr. (also known as GONZO247), I wanted to create a vibrant painting with more sea waters splashing a story for you! The seagulls whistled as they flew above and I fell in love with this beach moment! Digitally Painted from my Original Photo! 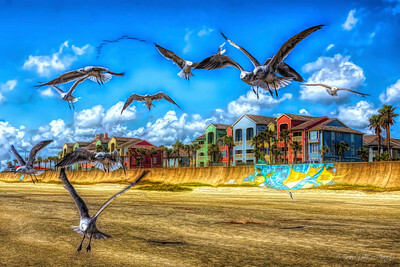 Seagulls, Galveston Beach This is my original photo (see #4324B-FA-1024 for my Fine Arts Digitally Painted piece). I needed to use this shot for my TravelWITWIT Blog! Enjoy! 1900 Storm Memorial Galveston, Texas One of my main purposes to spend a couple more days in Galveston yet once again was to capture a photo of a bronzed sculpture and monument that has become legend for this Gulf Coast town; “1900 Storm Memorial”. While I have photographed this amazing piece before I wanted to take special attention to it with a purpose to create a painting with the moon shining down on it. 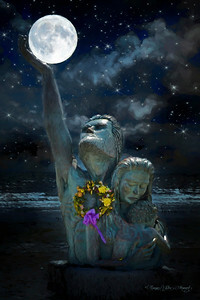 The monument is dedicated to victims as well as survivors of the 1900 Storm that took over 8,000 precious Galvestonian lives. David Moore, the artist, is well famous for many more notable pieces found around the city. He sadly moved on to Heaven in 2001 at the age of 80. With the devastation of Hurricane Harvey at least we didn’t suffer this grieved amount of lives taken from the Great State of Texas. Digitally Painted from my Original Photo! My original photo for use on my TravelWITWIT Blog! The Spot (Five Venues) Galveston Island Seawall Drive While The Spot is a popular and premier beachfront dining and entertainment point, they boast that every seat in their (house) “hut” is the best view of the beach! 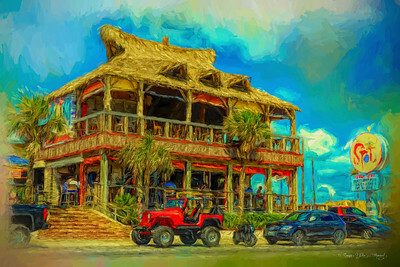 Enjoy the Gulf of Mexico while sprinkling lemon on their fresh locally caught shrimp, chomping down on their Award Winning Best Appetizers, sipping on their Ritas and hopping from one (house) spot to the next for a novel experience… Another words, you will most surely bounce from The Spot’s front entry to their Tiki Bar to their SideYard to their Rum Shack to their Squeeze’s outdoor courtyard. This was originally built from houses that were going to be torn down! For my moment here? I stood on the beach and turned around to capture a memorable view of their enticing venue! And, of course, later that evening we enjoyed their menu items and ocean front view! Digitally Painted from my Original Photo! My original photo for use on my TravelWITWIT Blog! 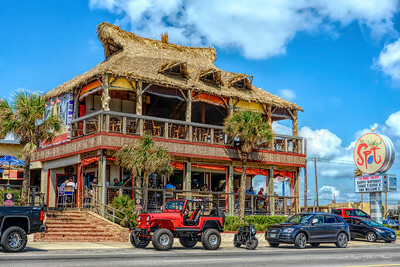 The Spot (Five Venues) Galveston Island Seawall Drive While The Spot is a popular and premier beachfront dining and entertainment point, they boast that every seat in their (house) “hut” is the best view of the beach! 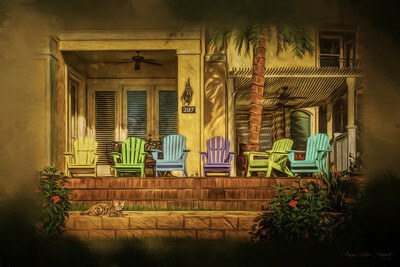 Enjoy the Gulf of Mexico while sprinkling lemon on their fresh locally caught shrimp, chomping down on their Award Winning Best Appetizers, sipping on their Ritas and hopping from one (house) spot to the next for a novel experience… Another words, you will most surely bounce from The Spot’s front entry to their Tiki Bar to their SideYard to their Rum Shack to their Squeeze’s outdoor courtyard. This was originally built from houses that were going to be torn down! For my moment here? I stood on the beach and turned around to capture a memorable view of their enticing venue! And, of course, later that evening we enjoyed their menu items and ocean front view! My original photo for use on my TravelWITWIT Blog! 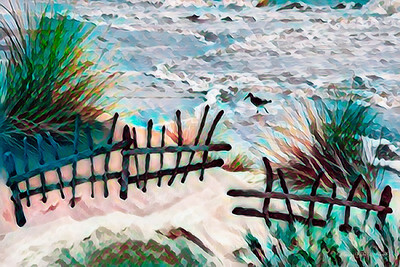 Sand Dunes Beach Front with SandPiper Bird in Galveston Texas Formulated with bits and pieces of my photographs in Galveston! 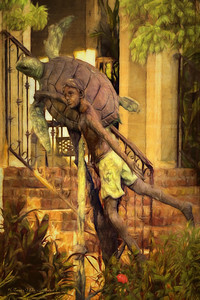 Sea Turtle & Boy Bronze Statue Clear Lake Shores, Texas Welcome to Clear Lake Shores once again! Along the way through this little city and driving around 15mph my SUV withstood countless curbside stops. The neighborhood is breathtaking with views of the yachting activities, the crystal clear Clear Lake, lots of geese toying around and engaging lawns and front porches of the many impressive homes! Clear Lake Shores has been nicknamed “The Yachting Capital of Texas” mostly due to since there are more boat slips than residents! 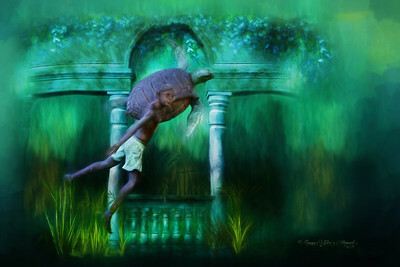 I loved this bronze statue of the young boy and sea turtle and decided to create 2 pieces of art works with it! Hope you enjoy! Digitally Painted from my original photo! Look The Other Way Galveston, Texas ~ Pier 21 During the summer of 2014 I had the pleasure of traveling mostly throughout my home State, Texas! 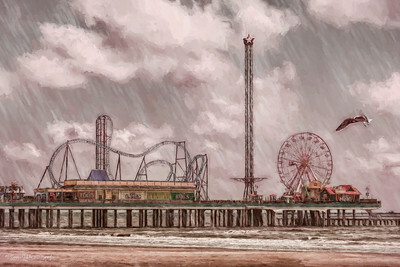 I had lived in Houston during college and was a frequent flier to Galveston Island, surrounding sites and the beaches. While having family spread across Texas, as a child my most fond memories are that of going to Houston with my family, meeting other close families and heading further south to the shoreline and beaches of Galveston Island. Swimming, tanning, sunburning, beach combing and sightseeing..... But never in my life have I ever seen as many pelicans as I did in August 2014. Zillions!! When asking about the shoreline being tattered with kelp and seaweed, I learned this tide-turning and changing works of mother nature was the reason so many pelicans and tropical animals were abundant! The forces of the moon and sun brought treasures to my Nikon D7000 lens! 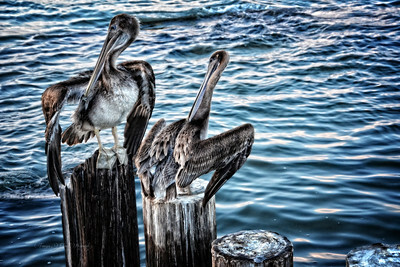 I was in Pelican Heaven! HDR Processing from my original photo! The Dawn Condominiums and Grafitti on Galveston Beach Seawall Boulevard I’ve always been attracted to the colors that blossom throughout coastal towns. The beach homes, condos and storefronts are dripping in quintessentially themes of turquoise, bright tropical shades of peaches and limes and sprinkled with citrus cheer! While most graffiti may tell a mecca story or detail a street-wise depiction of life in unusual comic or outcry mural form, the photo I took here shows a more informational quest to teach you the safety in watching the seafood’s destination from which you eat. 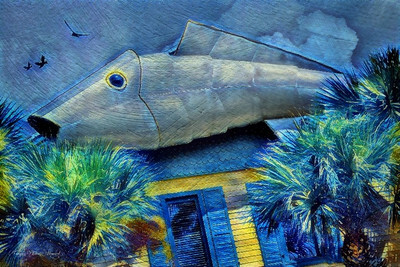 Hence, a Saving Wildlife styled mural and recommending to download the Seafood Watch App. Their goal is to make you aware of sealife animals that are caught in fishing nets. A Texas local artist, Mario Enrique Figueroa, Jr. (also known as GONZO247) has been a recipient of several Awards where he painted five murals to highlight the area’s wildlife and the threats and conservation work around them. An action focus for beach-goers to take in saving wildlife is painted throughout each of his murals. 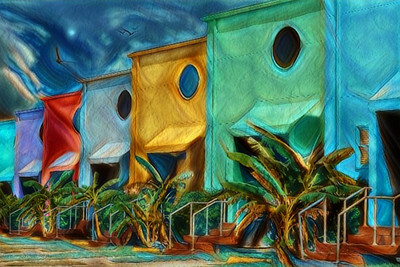 This mural can be found along the Seawall Boulevard between 69th Street and 73rd Street where the The Dawn Condominiums creates a colorful backdrop. Digitally Painted from my Original Photo! My original photo for use on my TravelWITWIT Blog! Four Seasons On The Beach Galveston, Texas Four Seasons On The Gulf Resort Having the pleasure of staying at Four Seasons in Galveston many times, I am delighted they now have painted their resort with wonderful electric beach colors; a change from the blue hue I grew up with. Not only are you a walk away to the beach, you are mere minutes to many of Galveston's historical attractions and tourist hot spots! 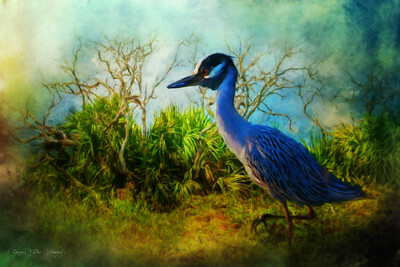 Digitally Painted from my original photo! 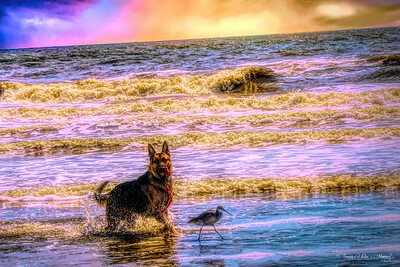 German Shephard & Sand Piper Galveston Beach Galveston Beaches are pet friendly! We took To-To with us on this trip and I am sad to say this may have been her last beach adventure since she is going on 19 years of wonderful years with me. (No Photo of To-To available yet) While we sauntered among the bubbling foam and streams of slow tides along come a scene I rushed to photograph! What a beauty this German Shepherd was to watch and I caught him just as a Sand Piper appears to make no mind to his splashing! I know it’s best to keep your pets on a leash, but sometimes you just have to let them play! Digitally Painted from my Original Photo! My original photo for use on my TravelWITWIT Blog! Big Fish (A) Fisherman's Wharf Seafood Grill Pier 21 ~ Galveston, Texas Who can say there is a best seafood restaurant in Galveston? You can't! I say this is one of the tops! 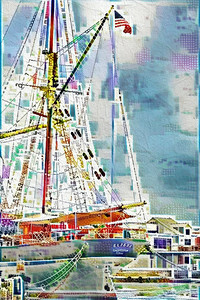 If you want to unwind from the day or just dine by the bay, this is the place where you can eat on the waterfront and enjoy fresh seafood, snag up what a lot of Texan's say is the "best shrimp on earth", behold the daily harbor life with ships and boats and dolphins, stroll through the Texas Seaport Museum (Home of The Elissa 1877 tall ship) and maybe catch a glimpse of a pirate or two! But what you will most definitely see is this BIG FISH at the entrance of Galveston's 1940's legacy! Digitally Painted from my original photo! Big Fish (B) Fisherman's Wharf Seafood Grill Pier 21 ~ Galveston, Texas Who can say there is a best seafood restaurant in Galveston? You can't! I say this is one of the tops! 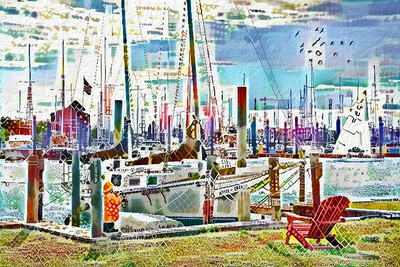 If you want to unwind from the day or just dine by the bay, this is the place where you can eat on the waterfront and enjoy fresh seafood, snag up what a lot of Texan's say is the "best shrimp on earth", behold the daily harbor life with ships and boats and dolphins, stroll through the Texas Seaport Museum (Home of The Elissa 1877 tall ship) and maybe catch a glimpse of a pirate or two! 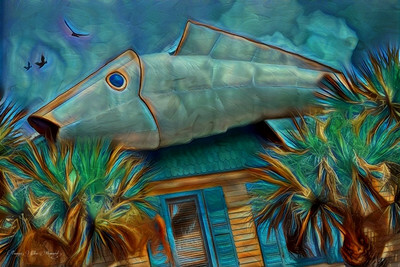 But what you will most definitely see is this BIG FISH at the entrance of Galveston's 1940's legacy! Digitally Painted from my original photo! 207 My Bay View Clear Lake Shores ~ Clear Lake, Texas One could fall in love with such a colorful neighborhood bustling along in Clear Lake Texas. My excursion through Clear Lake Shores brought much promising photo opportunities with an array of diversity from fishing, hebrons, geese, sail boats, people's front & back yards... I snapped and snapped photos all day! Digitally Painted from my original photo! Galveston Island Historic Pleasure Pier A day in Galveston wouldn’t be the same without a drive-by or the purchase of ticket to Galveston Island Historic Pleasure Pier! I call this photo “Summer Wonder” because you can’t help but remember the wonderment of riding a carousel or dawdling along an ocean front boardwalk during a vacation or family day with your loved ones. Pleasure Pier is packed with rides, dining and shopping adventures. I was pleased to see that Hurricane Harvey only did minimal amounts of damage to the pier and I caught a photo of some of the workers as they readied the rides once again! Digitally Painted from my Original Photo! My original photo for use on my TravelWITWIT Blog! One of my main purposes to spend a couple more days in Galveston yet once again was to capture a photo of a bronzed sculpture and monument that has become legend for this Gulf Coast town; “1900 Storm Memorial”. While I have photographed this amazing piece before I wanted to take special attention to it with a purpose to create a painting with the moon shining down on it. My original photo for use on my TravelWITWIT Blog!